OBD SECURITY & TRACKING - COMBATTING KEY CLONING. The only way the thieves can clone a key to enable them to simply drive off is by accessing the OBD port. Every vehicle has one. At Autosparx, amongst our vehicle security armoury we therefore offer Thatcham category 6 OBD tamper alert with tracking & monitoring. To summarise.... If our protective OBD port cap is removed, the owner gets an instant text and the 24/7 secure monitoring centre are alerted. 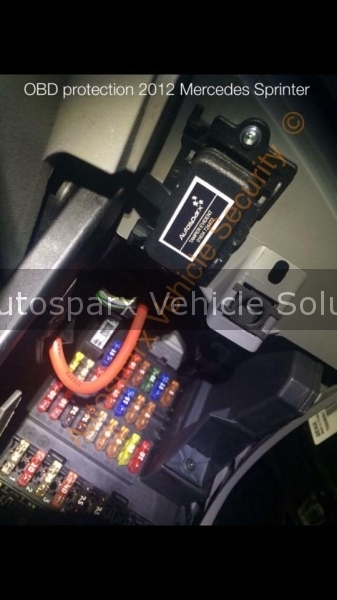 In addition, to slow them down, a secondary immobiliser instantly activates which renders the thieves cloned key useless & unable to start the vehicle. A determined & 'Professional' thief will go to great lengths to steal the target vehicle, it's a very lucrative business. But, the key is alerting the owner immediately when the vehicle is under attack, allowing you to act quickly and take out what ever measures necessary. You needn't be a victim. Or message Autosparx via our website.